I’m combining two days readings into one here. These last five chapters of the book are mostly a record in great detail of the construction and furnishing of the tabernacle. It’s easy to get lost in the detail, and although there is no doubt a lot of symbolism in the way it was constructed, I am not going to try and understand it all. But taking the making of the tabernacle as a whole, three things occur to me. Firstly, the image one might have, from the world today, of hundreds of thousands of refugees in a semi-arid country is that of hopeless people sitting in tents provided by aid agencies, with nothing to do. In fact, those who have had the privilege to work in such camps tell of the way in which the people work together to make the most of their situation. If you want inspiring refugee stories, try the UNHCR website. Under God’s leadership through Moses and Aaron, the Israelites managed to pull together to build a large place of worship at the heart of their ‘tent city’. Secondly, the amount of wealth shown here is simply stunning. The outer shell of the tent is leather (for waterproofing) but inside all is gold and other metals, coloured textiles and acacia wood. Some of this they would have brought with them out of Egypt, some they may have gained by trading (for they seem to have brought large flocks of animals with them). But the main thing to note is that all the people gave sacrificially to the construction of the tabernacle – whatever precious objects they had, were offered to the community as a whole for its place of worship and meeting. Too often I come across church communities where members of the church expect all the money for their projects to come from outside, whereas in fact God expects his people, then as now, to show their love for him in generous giving – “all things come from you, O Lord, and of your own do we give you” is part of the liturgy, but also needs to be an attitude for life. Thirdly, when all was finished there was a grand opening. The lamps were lit, incense burned, sacrifices made, no doubt there was much singing as well, and the glory of the Lord filled the tabernacle (as it did the Temple in Isaiah’s day). You can feel the excitement of the people as they awaited this climax of their giving and hard work, and the reward for it is to experience the very presence of God, in a way that few people ever have. Thus ends the book of Exodus, which (if the timings are to be taken literally) covers just the first year of what was to be a generation-long trek in the wilderness. But throughout that time, we are told, the presence of God would be with them and lead them on from one stage to the next. At the end of what may have been many years in the desert at or around the holy mountain of Horeb/Sinai, Moses is now told that his people have to move on. The land of Canaan will be given to Abraham’s descendants, as God had always promised, but not to this generation, whose place in salvation history had been to accomplish the Exodus and receive the law, a task that had been beset by many difficulties and setbacks. For now on the people of Israel would have to journey without God’s visible presence for a long time. The first lesson for us here is that we cannot expect to continue one particular form of relationship with God indefinitely. In church today we marked the festival of Candlemas, which celebrates the dedication of Jesus in the Temple but also marks the end of the long Christmas/Epiphany season with its teaching about God’s light and revelation in Jesus, and starts to look forward to the ‘darker’ days of self denial in Lent. The second lesson is that our experiences and our work are not for ourselves and contemporaries only, but for the future generations. The people of Israel in Moses’ time gave sacrificially of their jewellery and golden ornaments to make the tabernacle, and accepted the covenant of God’s law, even though it meant their life would have to be poorer and bound by the rules of the covenant, but from this the patterns of God-centred living and worship would be formed that would pass down the generations to come. This reading starts with the end of the account of Moses and Joshua up on the mountain for forty days (i.e. a long time) receiving the Law. At the end of this narrative, before they are given the carved tablets of the law (which incidentally were written on both sides, not one side as usually depicted) is a reiteration of the commandment to obey the Sabbath, perhaps the most defining mark of Judaism to this day. Why did God repeat the Sabbath commandment at this point, and not the others? He must have thought it in some way the most important. There is a perpetual tendency in all of us, however committed to a particular religion, to “backslide” – to let the busyness of everyday life get in the way of a relationship with God. I’m as prone to that as anyone. But if we can observe the Sabbath, which for Christians is usually interpreted as meeting with our fellow believers at least one a week for prayer and teaching, then there is less chance of slipping away from the faith altogether. Meanwhile down in the camp the people performed sacrifices, and in the absence of Moses and despite the “first and greatest” commandment only to worship the invisible God already being given, they quickly turned to the idolatrous worship of a home-made golden calf. Aaron’s pitiful excuse – “I threw the gold in the fire and out came this calf” – is like the desperate lie of a 3-year-old caught with chocolate in his hand. How slow we all are to acknowledge our sins! Moses’ reaction, apart from destroying the idol and scattering the gold dust on the water to prevent it being re-used, was to ask those who are truly “on the Lord’s side” to murder members of their own families who had participated in the ritual, presumably to prove that they truly did love God more than their families. Yet another reminder that their culture was so different to ours, although Jesus did also controversially say that we should love God so much that by comparison our love for our families should be as hate. After Moses receives the law, and reads it to the people, their next task is to build the Tabernacle (a portable place of worship for this nomadic people). The instructions are detailed, and many of its elements were perpetuated in the later Temple of Jerusalem and can be seen in Jewish or Christian places of worship to this day. The Ark which contained the book of the law, and symbolically the presence of God, is still the focus of the synagogues; and an altar (or communion table) the focus of most churches, where the sacrifice of Jesus rather than of sheep and oxen is remembered. Some churches retain the pattern of outer court, holy place and “holy of holies” in the division of the building into nave, chancel and sanctuary with its fixed altar, while others consider that Jesus intended to abolish this pattern, and their buildings are a simple space where people can gather informally for prayer, singing and preaching with a portable table for the communion. Neither is “wrong” and the two different approaches represent the tension in worship between God as the ‘holy other’ and God as living among us as our Father and friend. What Moses’ Tabernacle does remind us, though, is that we are a “pilgrim people” and the building should never be an end in itself, or the people resistant to change. God calls us to journey with him both literally, and in our life of faith. As Richard Giles titled his much-read book on church architecture, we should always be “re-pitching the tent”. 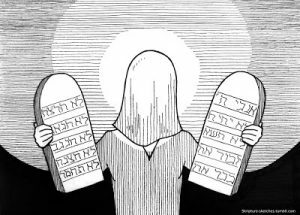 Parts of the Torah becomes very detailed, and some of its laws seem obvious and still good sense while others seem obscure to us in a different culture, but all are derived from the principles of the Ten Commandments. I will highlight just one, Chapter 22 verse 21 which is so important that it is repeated at 23:9: “You shall not wrong or oppress a resident alien, for you were aliens in the land of Egypt.” At the present time following the election of Donald Trump in the USA, and the many controversial right-wing policies he is starting to implement (not least strict immigration rules and a strengthened border with Mexico) it would be good for the American people to remember this verse, for all they (even “native” Americans if you go back far enough) were immigrants once. Britain is the same – we all trace our ancestries to one or more waves of incomers, be they economic migrants, refugees or invading armies. There is no such thing as a “pure race,” and no such thing as one tribe that owns the land while others have no rights in it. As it says in Psalm 24, “The earth is the Lord’s and all that is in it”. In chapter 24 we see Moses and the seventy elders going up the mountain where they actually see God. That is something exceptional in the Bible, for while God often speaks or sends angels (messengers), few people are allowed to see him in visible form directly. But it is important that they see that Moses is receiving the commandments from God and not just making them up. After that, Moses spends 40 days on the mountain to receive the detailed laws that followed. The 40 is of course symbolic of “a long time”, like Jesus’ 40 days of temptation or Paul’s 40-day retreat in the desert after his conversion. A long retreat (time alone with God) is still prescribed for those about to be ordained or at a point of crisis in their lives, so that they can be without all distractions to receive spiritual guidance for the task in hand. In chapter 20 we have the giving of the Ten Commandments. These simple but far-reaching principles, from which the rest of the Torah derives, are still well known today (in name, if not in detail) even by those who practice neither Judaism nor Christianity. Most people if asked to recite them will first think of the “thou shalt nots” – no murder, adultery, theft, lying or covetousness. Keeping these is the basis of civil society. If we can trust our neighbours not to kill us, take our partners or goods, to tell the truth and not to be envious of our possessions (or we of theirs) then we can live in peace with them, and any differences between us can be accommodated. But before these five commandments about dealing with other people come the five that are about our dealings with God and our families. To acknowledge there is one God, recognise that he is transcendent and cannot be reduced to an image, to worship no-one and nothing else, to give ourselves and our servants a day off a week, and respect parents (throughout our lives – this commandment is not aimed at children!) will help us live in a prayerful and considerate way so that the second set of rules will be easier to keep. As the illustration above shows, Moses was said to have his face veiled when receiving the commandments and passing them on to the Israelites. One reason may have been to emphasise that these laws were not of his own devising but of divine origin. Today’s readings covers several important passages including the provision of manna in the desert. This can be viewed as miraculous, or possibly explained away (at various times some sort of lichen, or edible insect secretion have been suggested, neither of which sounds very convincing). But whatever it was, it helped with the diet for a generation, and left a lasting impression that finds echoes in Jesus as the “bread of life” and so on. Chapter 18 has a more general application: Moses, finds himself in great demand, and does not of his own initiative think of delegating his work. It takes an old man – his father-in-law – to persuade him to set up a system of delegated governance and retain just the function of a high court judge for difficult decisions. Too many leaders, especially those whose charisma brings them many close followers, still fall into this trap. God’s gifts are given to many people, and while not all can be leaders of thousands, others can exercise skills as leaders of smaller groups and make decisions on simpler matters. The Exodus from Egypt, and more specifically the crossing of the Red (or Reed) Sea, is a pivotal moment in the history of salvation. This one day on which (if the numbers are taken literally) hundreds of thousands of people walked across the dried up salt marsh, to be followed by the Egyptian army whose chariots got bogged down and drowned by the returning waters, is the basis of much Jewish and Christian theology. Through the rest of the Bible it is frequently referred to as the ultimate proof that God saves those who call on him, as well as that the people of Israel were his chosen people. The passage of the Israelites through the water is also often seen as a symbol or foretaste of the sacrament of baptism as practised first by John at the Jordan, and later by the Christian church, and also a symbol of death and resurrection. Moses is similarly held up by later writers as the model of a “man of faith”. First he had had to confront Pharaoh on the basis of God’s promise that eventually the ruler would let his people go. Now he faces an even greater challenge of faith – he is told that by the simple act of waving his staff at the waters in front of them, his people will be saved and the Egyptians destroyed. If nothing happened, they pursuers would overtake them and all would be lost. But he acts, and is vindicated. May God grant us enough faith to do what he has commanded us, however simple.